The Backorder Audit Trail Report displays transactions of the automatic and manual backorders that have been filled. If you select Backorder Audit Trail Report, a screen will display upon which information pertaining to the report is requested. 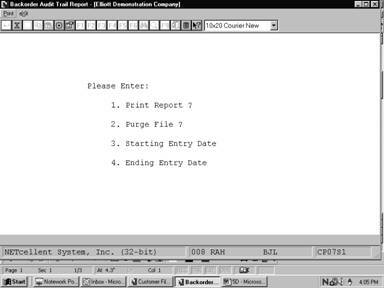 You have the option of printing the report while at the same time deleting the Back Order Audit Trail file records that are processed, or you may opt to leave the records on file. You may also choose to purge records in a specified range and not print any report. If you answer N, the selected purge range of Back Order Audit Trail file records will be deleted, but no report will print. The entry defaults to Y. If you answer Y, as the program processes each Backorder Audit Trail file record in the specified range it will then delete it. If you answer N, the records will remain on file after they are processed. The entry defaults to N.
Enter the earliest order entry date that is to be included in the range of Audit Trail records to be processed. The entry defaults to All. Enter the latest order entry date that is to be included in the range of Audit Trail records to be processed. The entry defaults to the starting entry date.